Bradley University. Located in Peoria, Illinois exactly two hours and forty-three minutes from Chicago on a good day. It has 4,649 students, give or take a few, enrolled as undergraduates. Exactly 26 derived from that total number make up the men's cross country team. And eight of those 26 just ran an unbelievable race booking their tickets to Madison, Wisconsin, the host of this year's D1 Nationals. 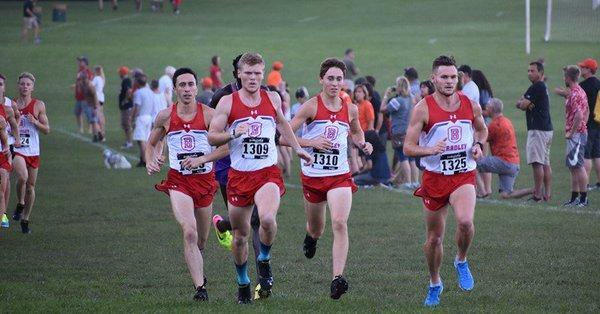 Bradley University men's cross country: first time NCAA team qualifiers. I had the opportunity to talk about this achievement and how it was set into motion with Jake and Luke Hoffert. The twins, almost indistinguishable from each other until you know them well enough, have spent their whole lives running together. They began their careers running for Yorkville High School. 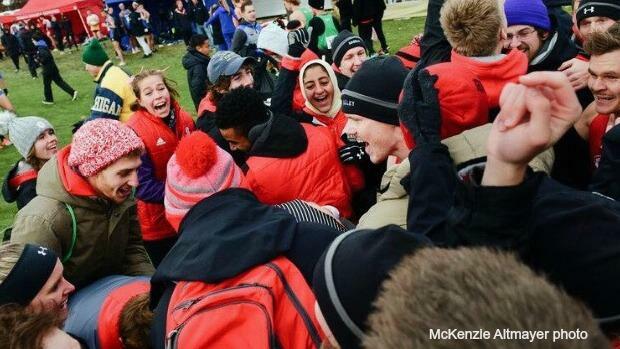 Their talent was obvious almost immediately garnering a lot of success, finally culminating in a 1, 2 run at the Illinois 2A state meet with Jake taking the title their senior year. From there the two signed their NLI to Bradley and cemented their place on a team that's making history. Curious about the starting point of this historic season, I began the interview with a simple question: when was the goal set to make nationals? The two lounged, still slightly in shock that the dream was accomplished, while they thought about it. It was like NCAAs had always loomed in the backs of their minds, something distant but still attainable, that it was hard to pick a starting point. Finally Jake, an individual NCAA qualifier in cross country last year, credited it to head coach Darren Gauson. Gauson, the reigning MVC coach of the year and now Midwest Region Men's coach of the year had planted the idea in Jake's head after National's last year. Jake described crossing the line and coach almost immediately saying: "you have the experience now, you'll know what to do next year when you have the whole team with you." The goal was so attainable this year because the men had a lot of people coming off redshirts or growing older and more experienced. Jake described that Gauson also referenced the rest of the team in his short speech, setting the goal in motion, saying that with everyone back and racing, Bradley would be stronger than ever. I followed up my first question with another, hoping to get more elaboration. I asked if this goal was something that was talked about often. Luke chimed in and described that he had it in mind for the whole summer, and both agreed that it was definitely pushing them to stay healthy and train the best they could. But Luke credited the moment of getting the whole team on board to a goal setting session while at camp. Bradley University cross country has a tradition of attending a team camp where we can bond but also train well together and lay a strong foundation for the upcoming season. Luke described that this moment is where everyone bought in. Rolling with that answer, I wanted to know more. Did something change this year in the team's mentality? They thought about it again, reflecting on this season that had become nothing short of magical, and hinted that it had been motivational during workouts. The idea became something that drove the team forward even during hardship and injury. Such hardship had been epitomized at the Wisconsin Nuttycombe race- one of the biggest races of the year. The Bradley men hadn't performed to the best of their ability that day to say the least. It was not representative of how strong this team is. Jake brought it up while Luke laughed, the race almost comical now that they had qualified to the biggest meet of the season. But that race had been especially tough on the men at the time. Jake described that it had definitely thrown some doubt on the goal, but made the drive stronger to do well at Regionals. This was sadly fairly common for the Hofferts. The two had dealt with different injuries throughout their collegiate career and it felt practically miraculous to get the two racing at the same time. Luke had been having a stellar start to his season, placing third in the first race and really helping to drive the team. But he was sidelined for a bit, and now still only running a few days a week but supplementing with cross training. But after these "hiccups" the two describe- with a smile- that the goal really came back in full force at the Bradley Pink Classic. From a spectator/ teammate's perspective, I agree that this is when everyone fully understood just how good this team could be. The men, fairly dominantly, took first, and the dream was reignited. I thought that there had to be more to this story, so I prompted asking just how different this year was from past years because of this goal. Jake described that other than the goal merely being motivational during workouts, there was definitely a shift in emphasis for the team. He described that everything was "more serious." Everyone understood that they needed to be on their "A game" in order to make this a reality. But he also elaborated that there was an understanding that this would be a full team undertaking. Last year, there was more emphasis on the individual qualifications, such as Jake or (since graduated) Taylor FloydMews making the meet. But that mindset was almost completely gone. Jake went on to say that there was "no emphasis on anyone making it individually even though we all were talented enough." He elaborated that the mindset had shifted for each member of the team, where instead of only aspiring for their individual goals it quickly became understood that "that this is the year that the team's going to make it or none of us are going to make it." No one wanted to go just as an individual when they knew this team was more than good enough to go as a whole. This new ideal really pushed the team forward and united everyone under the realization that this is the most opportune time the team has had so far to make nationals, and they rallied around doing it. My final question, which I was most excited to ask because I know that this team will never be complacent, was: what's the new goal going into the meet? Both Hoffert's let out a laugh in response. Luke was the first to speak, through a grin he said, "no one knows who Bradley is, no one knows who we are, but we made it and we wanna do something." That mindset of being the underdog, the one no one knows or expects has a lot of power, and they understand that and are ready to use it. I could tell that they took a lot of pride in being one of the smallest schools to make the meet because it means we're doing something right here in Peoria, something not a lot of other schools are doing. I'm not going to divulge the exact goal because that's for the men to prove. But they're not ready to settle. Jake really stressed that they could use the fact that they qualified as more motivation, "we know how hard it's going to be, we knew how hard it was going to be to make the meet, but we went and did that, and we're ready to do something really cool in Madison too." Only seven men raced at Regionals, but the Hoffert's still credited the team as a whole as being the ones that helped them make Nationals. They really stressed that they weren't sure they could qualify until mid-race during Regionals when they heard every member of the team, men and women, screaming that they were in second place and to hold on. They still can't describe the feeling of making it to the meet. The celebrations, the praise, and the overall shock still haven't been fully processed yet. Luke said with a laugh that he wouldn't fully comprehend that they had done it until he was on the starting line of Nationals or even mid-race. I know that this team is going to do amazing things in Madison and shock a lot of the NCAA. You can call me biased all you want, they are my teammates, but after Saturday you'll also understand just how good Bradley cross country is.